Want to improve your poker skills? Speed up your learning while you play at Zynga® Poker on Facebook®. State-of-the-art proprietary algorithms help you analyze your game. Increase your chances of winning, fair and square. 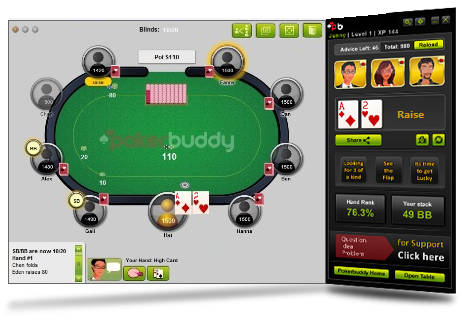 Any poker games or social network websites mentioned above are operated by third parties and their trademarks are owned by their respective owners; PokerBuddy is not affiliated to or endorsed by any of these third parties in any manner whatsoever.